The Brooklyn Law School Library is excited to announce a new and improved version of SARA, our library catalog. The new version is better suited to research in the 21st century. For example, its search screen and search algorithm are more modern than the old version of SARA, showing book jacket images of newly acquired titles, and assuming fuzzy searching, which forgives a researcher’s typographical errors or misspellings. After running a search, researchers can further refine their result list by values on the left hand side of the screen. For example, they can filter their results by topic, author, or place. They can also limit their result list to only items currently available in the library. Another useful feature is that a researcher can subscribe to a RSS feed of the result list. If she does so, every time the library adds a new title that meets the search parameters the item will appear in that researcher’s RSS feed. Besides these new capabilities, users can login to view their library account. Once logged in, users can see what items they currently have checked out, along with the items’ due dates. This list will include overdue items. If a user would like, they can renew any overdue item online while logged into the system. Users can also view their complete fine history, including outstanding fines and fines paid. Finally, users can review their personal information the library has on file, including their mailing address, phone numbers, and email address. The library staff is very excited about the new transparency the system provides for our users. We hope you find value in it too. If you are considering becoming a transactional attorney, then you should explore one of the library’s new databases, Practical Law Company. Practical Law Company is a database that is designed specifically for transactional attorneys. It specializes in providing straight forward information on how to complete a variety of transactions. It is designed to help get a deal done. PLC specializes in Corporate/Securities Law and Finance. They are, however, branching out into other areas of law, including Labor and Employment and Intellectual Property. Using PLC, you can learn how to form and organize a corporation, run a closing, conduct due diligence, draft a loan agreement, negotiate a merger agreement, analyze and compare deals, etc. The database contains numerous checklists, model documents and general overviews of transactional practice areas. The information contained on PLC is original content created by their own attorney editors who have practiced at top law firms and law departments. 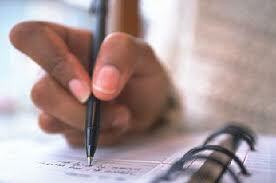 The attorney editors continuously update their resources to reflect current law and practice. A majority of AmJur 200 law firms subscribe to PLC. One of the most useful and exciting tools on PLC is the What’s Market platform. What’s Market allows attorneys to create custom reports which analyze, summarize, and compare public deal documents and securities filings. For example, you can create a report which details recent merger agreements of pharmaceutical corporations. This type of tool is not available on Westlaw or Lexis and can save attorneys inordinate amounts of time. If you would like to request access to this database, go to the url listed below and complete the form. You need to use your Brooklyn Law School email address in order to register. If you are interested in interdisciplinary research, then Web of Science is an excellent database to utilize for your non legal research. 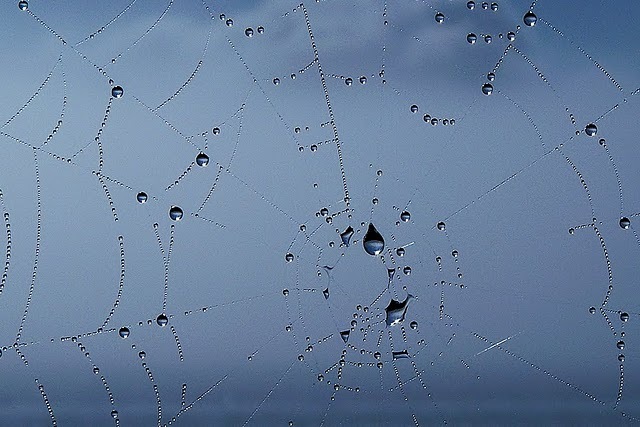 Web of Science is a multidisciplinary indexing tool, which means that it provides citation information for scholarly journals, books, conference proceedings, reports, and more. The database contains citations to over 10,000 high impact journals and over 120,000 conference proceedings. You’ll find current and retrospective coverage in the sciences, social sciences, arts, and humanities, with coverage available to 1900. Two useful tools available on Web of Science are the journal impact factor and the cited reference tool. The first tool, the journal impact factor, is a measure of the frequency with which the “average article” in a journal has been cited in a particular year. The impact factor helps you evaluate a journal’s relative importance, especially when comparing it to others in the same field. Much like Keycite or Shepards, the second tool, the cited reference tool, allows you to view what sources have cited to a previously published source. If you identify an article from Web of Science that you would like to read, you can search the Library’s E-Journal Portal to determine whether or not the journal is available electronically. If it is not available electronically, then you can request that the article be delivered to you through ILLiad, the Library’s interlibrary loan system. See this previous post for more information on how to submit a request through ILLiad. If you have any questions about Web of Science, E-Journal Portal, or ILLiad, please contact a reference librarian. 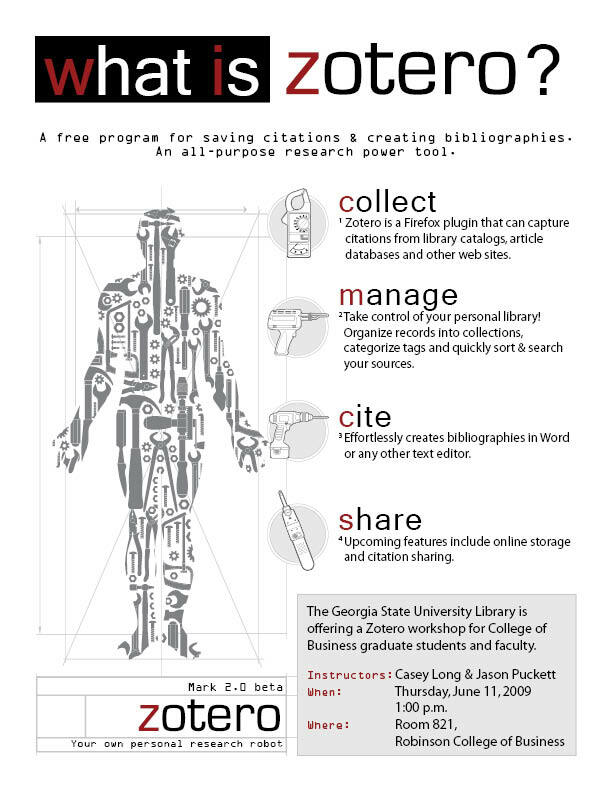 Enter Library’s Wordle Contest Today! 1. 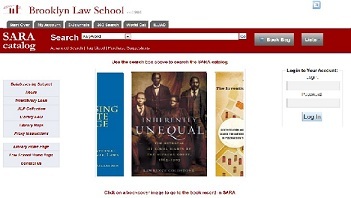 Go to Brooklyn Law School Library home page. 3. Guess the official title of the legal document (from around the world), which the Wordle describes. 4. Provide the Bluebook citation. 5. 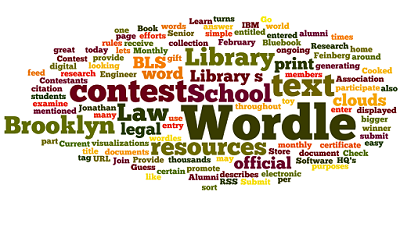 Submit your answer to BLS Library Wordle Contest HQ’s. The winner will receive a $30 gift certificate to the Brooklyn Law School Book Store. Contestants may only submit one entry per monthly contest. Learn more about the contest and examine the official contest rules. The Brooklyn Law School Library has thousands of legal documents in its print and electronic collection. This contest is part of the Library’s ongoing efforts to promote its resources to students and alumni. Current BLS Alumni Association members are also entitled to use the Library’s print resources and many of its digital resources for research purposes. Join today. Wordle is a toy for generating “word clouds” from text that you provide. Cooked up by Jonathan Feinberg, Senior Software Engineer at IBM Research, Wordle lets you enter text or any URL with an RSS feed and turns the words into ‘wordles’, great looking visualizations of the entered text. The more times a certain word is mentioned throughout a text, the bigger it’s displayed, sort of like tag clouds.